Heroes are great. The people we look up to and who influence us are so important. Our parents, pastors, great theologians and teachers, all keep us going. I want to introduce you to one of my heroes, Norm. Norm is a great guy. He was born March 25, 1914 and while his birthday will probably never be celebrated the way it should, you will remember his name when this story is finished. Norm was the descendant of Norwegian parents. He grew up on a farm in Iowa and attended a one-room school house until the ninth grade. Sports were important to Norm, as to any kid his age. He played baseball and wrestled in high school. It was his grandfather who pushed him academically. He wanted nothing more for his grandson than to get a good education and to work hard. As a result, after high school Norm attended the University of Minnesota. Because of financial strains, though, he frequently had to dropped out and earn money for tuition, room, and board. During one hiatus from school, Norm worked for the Civilian Conservation Corps where he helped jobless men work federal projects. While working for them he discovered that many of the men were starving and malnourished. When he returned to school, he studied agricultural biology and plant pathology. In 1942, Norm earned his PhD. It was in 1944 when he started his work in Mexico. The Rockefeller Foundation needed someone who could figure out how to increase wheat yields in the agricultural areas and to help starving folks out of poverty. He did just that. 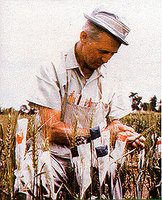 Norm genetically altered wheat and corn to grow on shorter stalks, bigger heads with increased yields. Because of his work literally millions were saved. By 1960, Norm was looking somewhere else in the world. By the mid Sixties, he was in India and Pakistan where one of the world's worst famines was killing millions of children, women, and men. Again, using the altered strains of wheat and corn, Norm saved millions. The decade was not without adversity. Between politics of the region, Mexico, and US Customs, Norm almost failed. By 1970 it is estimated that Norm literally saved over 1 Billion people. For those of you in the UK that's a thousand million. That was also the year that Norm won the Nobel Peace Prize for his humanitarian efforts. But the award slowed him down. According to an interview with David Turrant of the Dallas Morning News, Norm said, "It was a disaster as far as I'm concerned. You get pushed into so many things. A lot of your energies are cut off from the things you know best. Some of them you have to do. Because you end up being the spokesman for science in general." Now while Dr. Norman Borlaug fights to keep hungry people fed in Mexico and Africa he is forced to fight extremist organizations like GreenPeace who convince corrupt governments in Africa from receiving genetically altered seeds. GreenPeace calls such food "frankenfoods" and protests, at times violently, their use. GreenPeace supports the strict use of organic foods in supermarkets and in homes. What they don't tell you is that if all of the earth's farmable land (that would include cutting down every rain forest in the world) were used to grow and raise only organic foods, two thirds of the world's population, that's over 4 billion (4 thousand million) people would die. 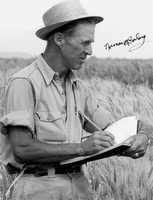 While Dr. Borlaug feeds the world, GreenPeace would starve it to death and they're not alone. There are other organizations (such as Organic Consumers Association and Rainforest Action Network) that allow people to die in the same way. I prefer to allow people who are starving to death go ahead and eat while GreenPeace searches for evidence (any . . . at all) that genetically altered foods can hurt us. Thank you GreenPeace for caring so much. However sarcastically I treat GreenPeace, my prayers are with Dr. Norman Borlaug. May God bless him as he does what the Church doesn't even seem to be able to do. 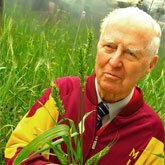 Perhaps we, the Church, could see Dr. Borlaug as a hero and may he inspire us to follow in the footsteps of the Christ of Our Lord in feeding the hungry! 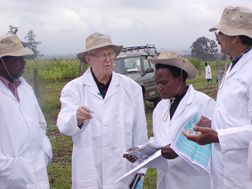 If you would like to find out more about Dr. Norman E. Borlaug go here or here or here. Good man, great plan, need more like him. While I am leaned back in my recliner with my remote and a package of wavy chips and a dip trying to figure out how to lose pounds, so that my car doesn't have to work so hard and burn so much gas to pull the extra load, this man does good. 1914? At 92 he looks good as the work he is doing. It must be all that organic corn he has been eating? uh? 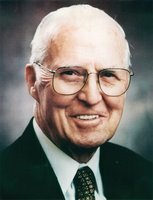 I won't argue the matter of the responsibility of the church to feed the world but I just wish the genetically altAred corn(pone) that is proclaimed from our pulpits would get the same results as Dr. Norman Borlaug's. He saved over 1 billion people? 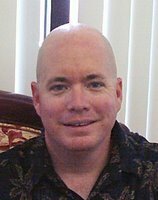 I'v just been asking the people I pastor to save ONE of their family/friends to the Kingdom. Hey, is Senior Pastor Ed Abla now a blogger? That's great! 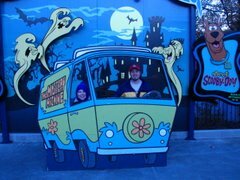 Hope all is well. I realized I never let you know what happened with my job. Antonina and I are back in Ohio...Toronto on the Ohio River in East Ohio. It is a great church fighting the battle of existing in area loosing jobs, money and people everyday. We are having fun watching the miracles God is working in our congregation. Bye! A great tribute and very well written. Thanks.